These quotes are all part of a larger story currently being told in a new exhibit on Level B of Homer Babbidge Library. “Our Community at Winchester: An Elm City Story” is the story of the Olin-Winchester Repeating Arms plant, one of New Haven’s most important employers of the 20th century. The history of the plant and the stories of its workers are told in 35 display boards of oral histories, photographs and other documents such as newspaper clippings and company memos. They chronicle the company’s creation in the late 1800s up to the aftermath of its closure in 2006. Like many large corporations, it has had its fair share of triumphs, struggles and controversies. 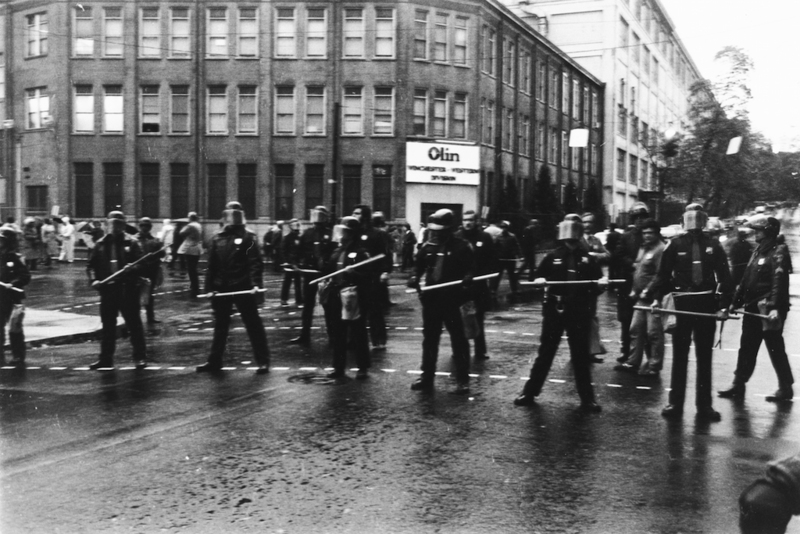 The elements of the exhibit, compiled by Joan Cavanagh, archivist and director of the Greater New Haven Labor History Association, tell the story of labor struggles, union battles, racial tensions and impact on the community brought on by the manufacturing giant. Especially compelling are the oral history accounts, which were collected by Dorothy Johnson and Lula White, two sisters whose father worked at Winchester. The accounts, both positive and negative, paint a picture of life for the various workers at the plant. Along with photos of the interviewees, quotes and background information give a vibrant overview of each of their individual experiences and often, struggles. The exhibit will be on display until June 13, 2016. It’s definitely something to check out, whether you need a quick study break or just want to learn something new. 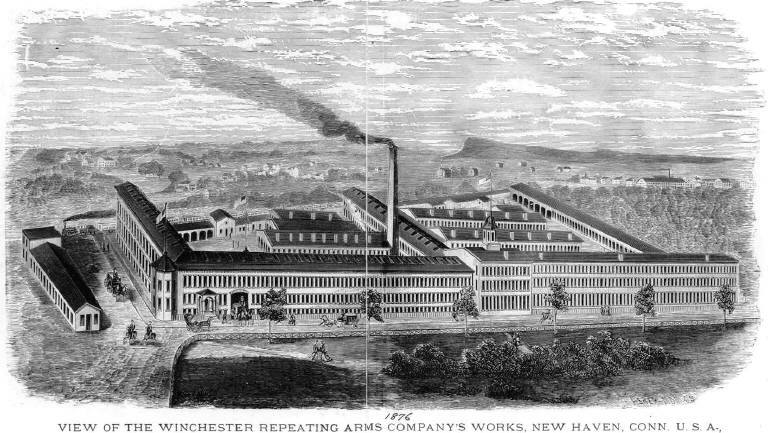 There will also be a reception and gallery talk April 18, 4:30-6:30 p.m. titled “Workers at Winchester: Community, Contradictions and Struggle” by Joan Cavanaugh, Archivist/Director of the Greater New Haven Labor History Association. 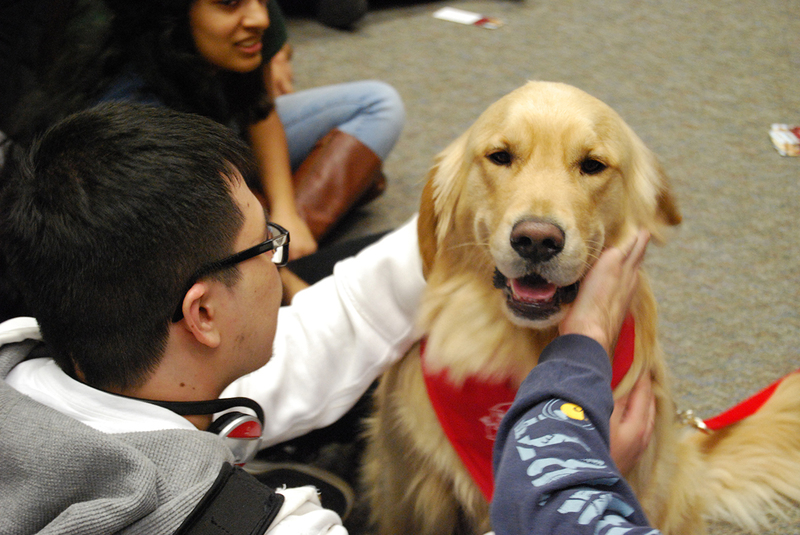 Paws to Relax this finals week with therapy dogs! 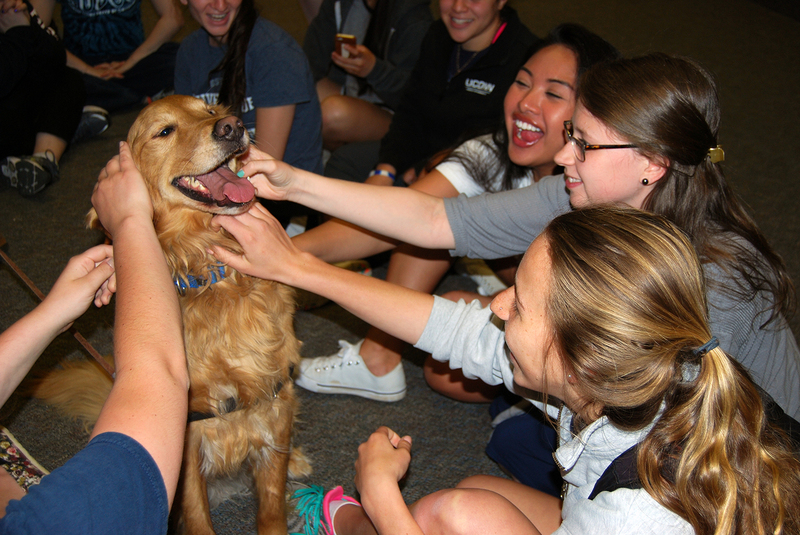 Once again, the library is bringing students the only positive aspect of finals week: dogs in the library! Afternoons Monday through Friday, don’t be surprised if you hear the pitter patter of paws in Homer Babbidge, as humans will proudly accompany their dogs to the first floor to provide students some much needed stress release during finals week. Therapy dog Andy plays with students at the library. The program, aptly named “Paws to Relax,” originated in spring of 2010, when a library staff member suggested bringing in therapy dogs for students during finals week. Jo Ann Reynolds, the library’s Reserve Services Coordinator and self-proclaimed “dog person,” made a few calls in the canine community to help get the ball rolling, or in this case, the tail wagging. Soon enough, registered therapy dogs from multiple organizations including Cold Noses, Warm Hearts, Allen’s Angels, and Tails of Joy were headed to Homer to help students de-stress during their exams. On the first day of the program, Reynolds and the Laurel Rabschutz, owner of the first therapy dog Dooley, a Newfoundland, were worried about how students would know about Paws to Relax and whether it would be popular. They soon found out that they need not worry. According to Reynolds, within minutes at least 30 to 40 students were surrounding Dooley and texting their friends to alert them to the dog’s presence. Therapy dog Luke getting tons of attention during finals week. 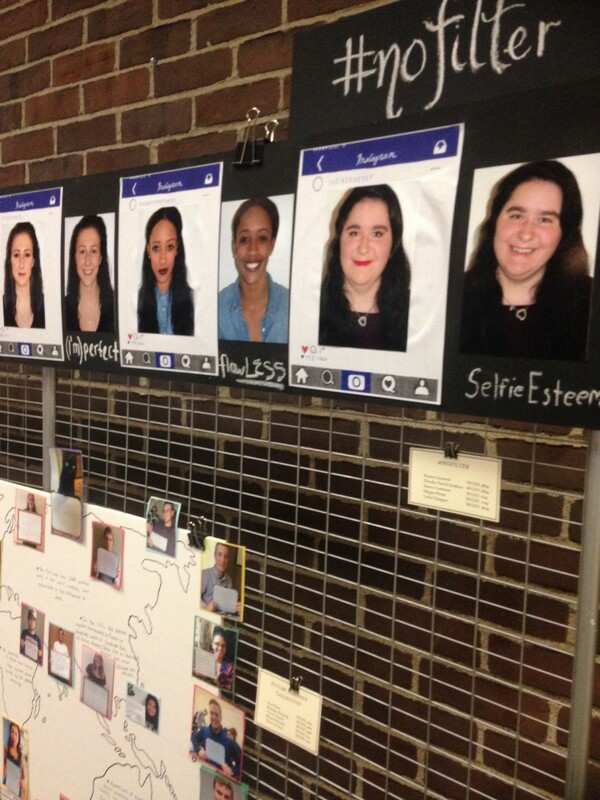 After the first semester of the program, UConn got a lot of publicity. Newspapers, radio and television stations were all stopping by to document the dogs. Reynolds even had to institute a lottery system because so many therapy dog owners wanted the chance to visit. The library staff is happy to offer this beneficial service for students. “The dogs help them relax. People tend to think of therapy dogs in nursing homes or other places, and don’t think of students as much. But they are also in an institutional situation away from their family and their pets,” said Reynolds. Apparently, even science can back up how much we love dogs. Students have outwardly expressed their enjoyment of Paws to Relax. When staff put up a white board where students could write their opinions of the program, the responses were overwhelmingly positive. “I just got out of a tough exam and seeing the dogs was the highlight of my day,” “Best idea ever!” and “I love coming here in between exams” were just a few of the many comments. The staff also does their best to minimize the footprint of the dogs so that students who need to avoid dogs because of allergies or other issues can do so with ease. If you want to take a study break with someone practically yelling “Pet me! Pet me!” check out this year’s schedule below. Two UConn students are helping to make sure their peers’ voices are heard on a very important topic: the library. Erika Elechicon, a political science and communication double major and the USG Vice President’s Chief of Staff, is the undergraduate student representative to the Vice Provost’s Library Advisory Committee. Michael Ambroselli represents the graduate student population. The students serving on the Provost’s Library Advisory Committee are working to represent UConn students in important library issues. In this role, Erika and Michael sit in on important meetings with the Library’s Vice Provost, Martha Bedard, and faculty representatives from various academic departments. The committee of approximately 15 faculty, students and administrators discusses issues regarding the library and how to handle them. Elechicon is doing just that. She contributes to major discussions on library issues, such as the effects of the state’s proposed budget cuts and the adoption of open source textbooks, things that could have major consequences for students in the future. Michael Ambroselli, the graduate student representative to the committee, agreed with Elechicon. Both Elechicon and Ambroselli chose to participate in this committee because they realize how important the library is for all students at UConn. “The library represents the cornerstone for all scholarly and research activity at a research institution such as UConn,” said Ambroselli. 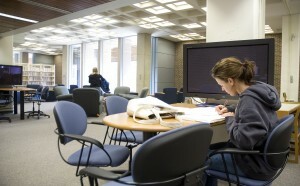 “The library isn’t just a place to sit and study, it’s a resource for students and faculty,” said Elechicon. “Trade Offs: The Reality of Working Women” by Adrienne Gutierrez, Jacqueline Pagano, Heather Norris, Emily Powers, and Ami Vasquez. “Art and Activism in the Humanities” is student work as part of our collaboration this semester with the Women’s, Gender and Sexuality Studies Program series “Feminism/s and Future/s.” These works are from students in several classes in WGSS where they were asked to consider the meanings of feminism in the future and the kinds of future they envision. Using the lens of “Art and Activism in the Humanities” to identify, interrogate, and express their thoughts on everything from marginalized bodies and household economics to sexualization in the media and changing gender expectations around the world, these students produced a close examination of utopias, dystopias, US and global movements for social justice, and the many ways in which the personal is political. 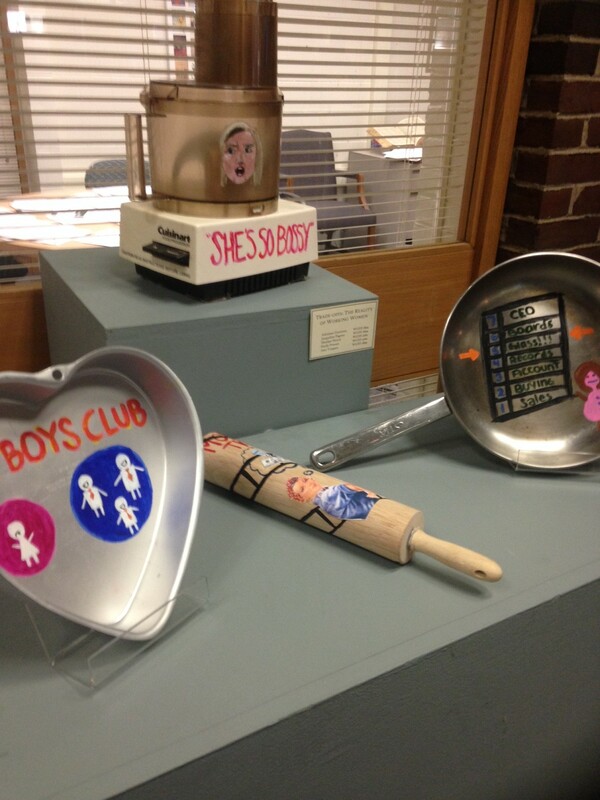 The exhibit is located on the Northwest side of Level 1 for the next few weeks. The public is invited to a reception on Monday night from 5-6:30 where you will have the opportunity to talk to the students as well as join in some gender-neutral swing dance lessons. Faculty members play the key role in choosing, adapting, and developing new learning materials and methods which leads to student success. This symposium will be an opportunity to enter into conversations about the pedagogical possibilities that open/affordable learning resources offer and to become inspired to explore and integrate them into your own classrooms. These resources allow a freedom to develop, reuse, and remix materials of all types to create dynamic and engaging courses, all without increasing student debt or leaving behind students who are unable to afford expensive traditional materials. We will be joined by experts on the national stage as well as those who have had success here at UConn to lead the conversation on the challenges and rewards to this style of teaching. 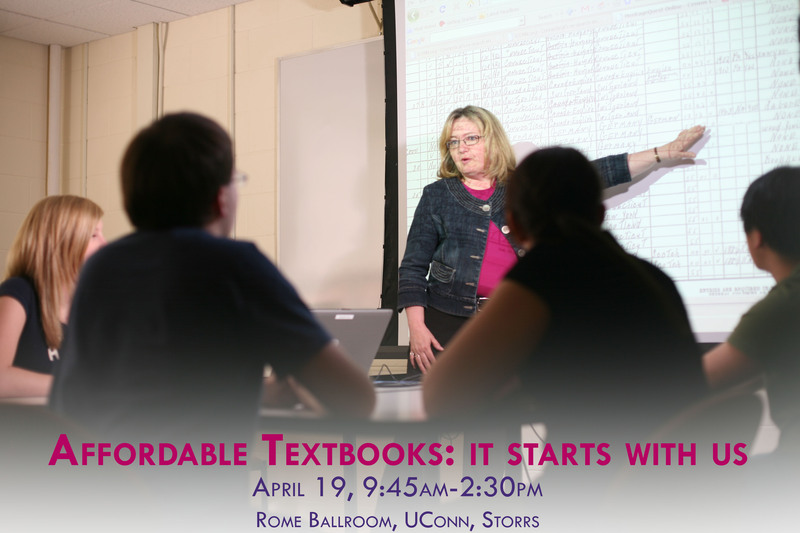 The symposium is being sponsored by the UConn Affordable Textbook Initiative (ATI) Task Force through a grant from the Davis Educational Foundation and the University Student Government. Established in 2015 by the Provost’s Office, ATI is looking into best practices for excellence in teaching and learning using new, open, and/or alternative materials and methods that are more affordable for our students. Registration is free and required. Lunch is included. Dr. Wiley is Chief Academic Officer of Lumen Learning, an organization dedicated to increasing student success, reinvigorating pedagogy, and improving the affordability of education through the adoption of open educational resources by schools, community and state colleges, and universities. He is also currently the Education Fellow at Creative Commons and adjunct faculty in Brigham Young University’s graduate program in Instructional Psychology and Technology, where he leads the Open Education Group (and was previously a tenured Associate Professor). If you have any questions, please contact Kathy Labadorf.